We have each of these things in ImproveCareNow and in future LOOP posts I will share examples of each. But one that I didn’t list,which became very clear to me at the conference, is that the best communities take risks together. I want to share a bit more about that here. One of our conference goals was to brainstorm new interventions—in QI-speak, “changes to test,” - that will help us get even more kids with Crohn's disease and ulcerative colitis into remission. Prior to the conference, we developed a new list of key drivers—or focus areas—that we thought were most important to improvement. Now it was time to crowd-source the best ideas for interventions to tackle in each area. This tends to be the most fun part of the process! 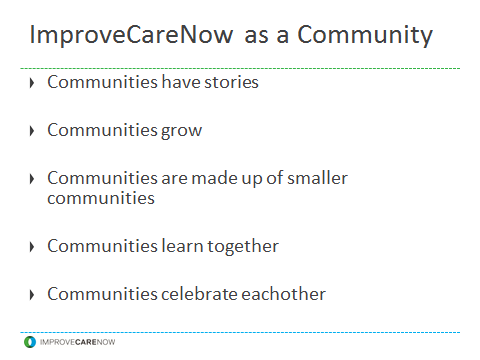 The ImproveCareNow Network has developed interventions together before. But this time, we wanted to make sure our incredible diversity and stakeholder engagement was really reflected in these new interventions. 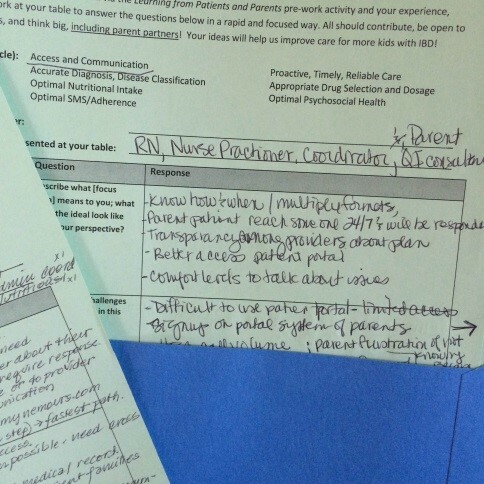 In the weeks leading up to the conference, each center interviewed patients and parents to get input on challenges and opportunities in each Key Driver area. In doing so, they opened themselves up to a variety of feedback; I know this felt risky to some centers. But as a community we took the risk together. Prior to the conference, nearly all of our 254 participants chose the three Key Drivers that most interested them. Once we received their choices, we put together small groups (6-9 people) that were as diverse as possible-blending people from different centers and with most groups including at least one patient, one parent, and others from several clinical roles. Planning this felt risky even as it felt like the right thing to do. Would people want to spend almost two hours of valuable conference time in an informal exercise with people outside of their peer groups? Would lone parents and patient at the tables feel overwhelmed, ignored, or vulnerable? Would conversations stall with the minutes ticking by slowly? It ended up being a risk well worth taking. Between 2:00 pm and 4:30 pm on Saturday the low, quiet, steady buzz of conversation eased all of my concerns about people diving in and learning with those very different from themselves. Many observers noted that as groups tackled the provided questions, the first thing they did was turn to the parent or patient at the table—deferring to their expertise. When each of the three 40-minute discussion periods ended, we worked harder than expected to get each group to wrap up and move to their next tables. And the notes that were shared—and will guide our work in the months and years ahead—are full of some of the richest, most diverse insights I’ve seen in my quality improvement career. We work hard to make sure all participants in this community have the quality improvement structure, skills, and tools to achieve their goals. Even more important is making sure the right centers and people connect so they can do more together than alone. 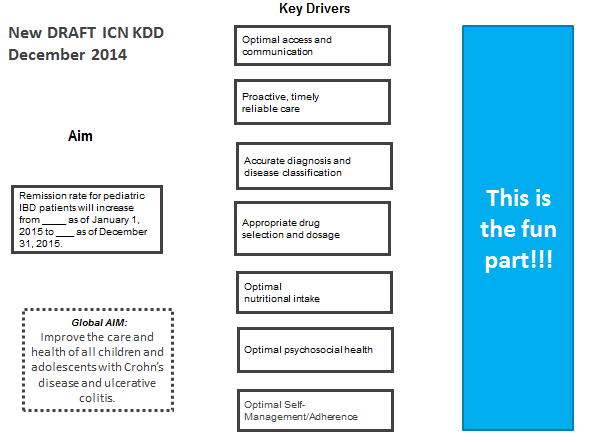 We foster this online on our ICN Exchange knowledge commons, on monthly webinars, and at our Community Conferences. Admittedly, this gets a bit more challenging as we grow and we don’t always get it right. But what these collaboration sessions showed me is that community members desperately want to keep connecting across roles and centers and that they embrace the expertise of everyone at the table. They are building their own momentum and will continue to do so even as we get bigger and push our network infrastructure to keep up. So thank you to the ImproveCareNow community for taking risks together, leaving roles and titles aside, and creating a better today and tomorrow for and with kids with IBD.